Earn $30.10 in Rewards credit. Click to learn more. The Mallet DH Pedals have been the choice of riders the world over for years, and now Crank Brothers is cranking it up a notch with the DH 11. Featuring lightweight titanium wings nd dual chamfered edges, the DH 11 features a new construction and design that reduces weight while simultaneously improving performance. With its distinctive black and gold colorway, the DH11 gives off a premium look. 8 adjustable pins on each side work together with the concave shape for secure pedaling in all conditions. 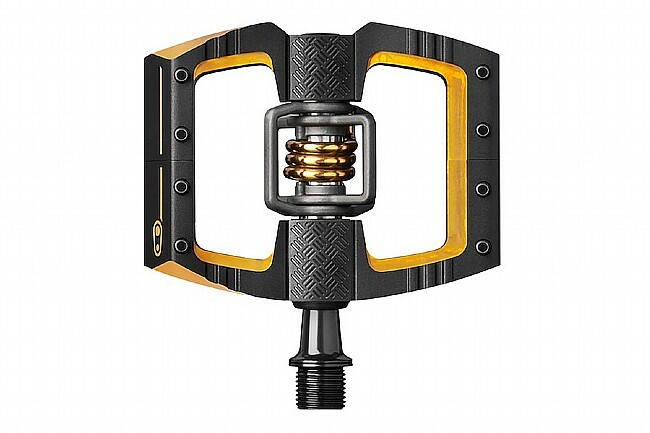 The Crank Bros Mallet DH 11 Pedals includes Cranks Bros' Premium Brass Cleats and is compatible with 2-bolt mountain bike shoes. Titanium wings to reduce weight. Dual chamfered edges to reduce rock-strikes. Exclusive double-anodized black and gold colorway. Concave platform for secure foothold. 8 adjustable pins per side for grip. Integrated traction pad technology to optimize the shoe/pedal interface.